The Congress ended the ruling BJP's winning streak in India's heartland, winning Chhattisgarh and emerging as the largest party in Madhya Pradesh and Rajasthan, in state elections that are seen as the dress rehearsal before next year's national polls. “We accept the people's mandate with humility,” Prime Minister Narendra Modi tweeted on Tuesday evening as his party lagged in big states even before all results were in, reports NDTV. Telangana, India’s newest state, voted back K Chandrashekar Rao's TRS and in Mizoram, the Congress was ousted by the tribal Mizo National Front. 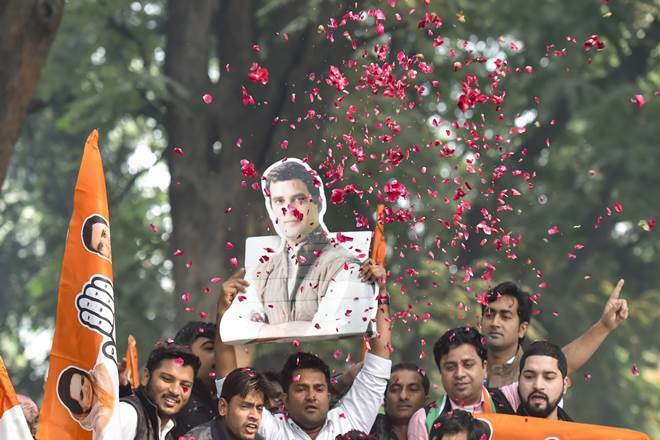 The Congress has won 114 seats, two short of the majority mark in the 230-seat assembly. The BJP is not far behind with 109. Votes were counted overnight in Madhya Pradesh, where the Congress sought an appointment with Governor Anandiben Patel around midnight in a letter mailed and hand-delivered for good measure. Congress leader Kamal Nath told reporters at 2:45 am Wednesday that his party "had won an absolute majority". The party ended up two seats short, which means it needs help. Kamal Nath had yesterday reached out to Bahujan Samaj Party (BSP) leader Mayawati, who had snubbed the party during pre-poll alliance talks. A leader of Mayawati's party, Sudhindra Bhadoria, told NDTV that the party would do all it can to stop the BJP from coming to power. In Rajasthan, the Congress was at 99 and touched the majority mark of 100 with its ally Ajit Singh; elections were held for 199 of the 200 assembly seats. The BJP has won 73 seats, Mayawati's party has won six. The Congress scored its best election results in years on a day it marked a year since Rahul Gandhi's takeover. The party hopes the state election gains will consolidate its chief's role in opposition efforts to form a grand alliance to take on PM Modi in next year's polls. Accusing PM Modi of letting down voters and not delivering on his promises, Rahul Gandhi said last evening, "Mr Modi has taught me what not to do... Arrogance is fatal for a politician". The shock defeat for the BJP was in Chhattisgarh, where Raman Singh was considered one of its most popular chief ministers. The Congress has far outstripped the BJP in the Maoist-hit state, winning 65 of the 90 seats and leading in three. The BJP has won 15 seats. The alliance of Ajit Jogi and Mayawati has won seven seats.